Molds are types of fungi that grow in the natural environment. Tiny particles of molds are found in the air both indoors and outdoors, producing microscopic cells called “spores” that are spread easily through the air. When mold spores land on a damp spot, they may begin to grow and multiply. A wet surface or material that is not dried or discarded quickly (for example flooding or water damage from a burst pipe) can prompt the growth of mold within 24 to 48 hours. Many building materials provide suitable nutrients that encourage mold to grow. Wet cellulose materials, including paper and paper products, cardboard, ceiling tiles, wood and dust, paints, wallpaper, insulation materials, drywall, carpet, fabric and upholstery commonly support mold growth. Moisture control is the key to mold control. Molds need both food and water to survive. 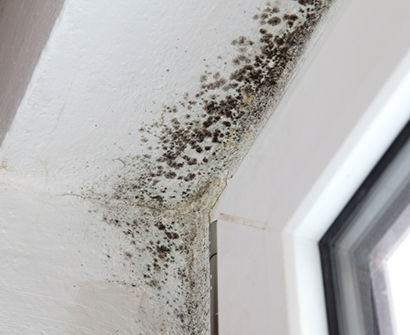 Since molds can digest nearly anything, water is the factor that limits mold growth. Common sources or causes of water or moisture problems include roof leaks, deferred maintenance, condensation associated with high humidity or cold spots in the building. Controlling moisture, temperature, and humidity is the only way to prevent the expansion of mold growth in your home or office. I Have Mold, What Do I Do? Call Restore-One, your mold remediation and abatement experts. Some states have licensing programs that are a requirement for mold inspectors and/or mold remediators. These states include, but are not limited to: Texas, Louisiana, Florida, Maryland and Arkansas. It’s critical to partner with a company that has licensing requirements, certifications and experience to handle the complexities of a mold remediation project. Restore-One’s mold remediation specialists are trained and certified in the latest techniques and equipment to abate your property when mold appears. Following the EPA, CDC, IICRC S-520 and NORMI standards, along with the certification of state and local governments, Restore-One certified professionals have the training and experience you expect. We recommend that an independent licensed Industrial Hygienist conduct both pre-test and post-test samplings to document proper protocols and complete customer satisfaction.